One of eight new dogs that has been trained to sniff out ivory in airports and ports in Kenya and Tanzania to combat wildlife trafficking, Nairobi, Kenya. Countries Sunday observed World Environment Day, whose theme this year is combating the $20 billion illegal wildlife trade. 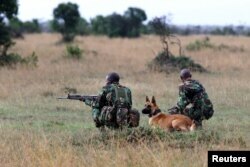 In East Africa, a new team of sniffer dogs has joined the fight. Asha, an English Springer Spaniel, excitedly twirls in circles and strains on her leash. She scrambles over suitcases on a conveyor belt full of luggage at Jomo Kenyatta International Airport in Nairobi. Floppy ears and a lolling pink tongue give her a playful look, but Asha is hard at work. Asha sniffs a canvas backpack, briefly sits, then excitedly grabs a toy her handler gives to her. This is her reward for finding a piece of hidden ivory during a demonstration of her abilities. Asha has been specially trained to sniff out ivory in airports and ports in Kenya and Tanzania. She is part of a new team of eight sniffer dogs combating illegal ivory trafficking trained by the African Wildlife Foundation in partnership with the Kenyan Wildlife Service and Tanzania’s wildlife division. Eight more dogs are being trained in the program and will be deployed to Mozambique and Uganda. Kenya Wildlife Service (KWS) canine handler Patrick Musau leads his dog Rocco to sniff through luggages on February 12, 2016 at the Jommo Kenyatta International airport, Nairobi. Since they started in January, the dogs have led 26 busts of ivory and other illegal wildlife products. “If you have four or six busts in one month, that’s really something. It speaks to the international community that this area is well-guarded and we are combating wildlife trafficking,” said Mark Kinyua, head of Kenyan Wildlife Service’s Canine Unit. At the end of March, sniffer dogs confirmed a large seizure of ivory in cargo transiting through Nairobi on its way to Bangkok from Mozambique. The ivory was worth more than $60,000. FILE - A special unit of wildlife rangers demonstrate an anti-poaching exercise ahead of the Giants Club Summit of African leaders and others on tackling poaching of elephants and rhinos, Ol Pejeta conservancy near the town of Nanyuki, Laikipia County, Kenya, April 2016. Michael Ogwora, a dog trainer with the African Wildlife Foundation, says the dogs are highly attuned to sniffing for ivory. But the dogs are also detecting other illegal wildlife products, including more than 500 kilograms of pangolin scales in cargo at Nairobi’s international airport in March, and 16 lives turtles in May. This year, about 1,000 kilograms of pangolin scales have been seized. The dogs at Nairobi’s international airport have made more finds than any other detection dog teams in East Africa, said Will Powell, African Wildlife Foundation’s Conservation Canine Director. Powell is based in Arusha, Tanzania. For 20 years, Powell has been training dogs to sniff for landmines and explosives in conflict zones such as Afghanistan, Bosnia, Sudan and Ethiopia. Powell says training dogs to sniff for ivory is not so different from teaching them to detect explosives. When they find the target substance, dogs are rewarded with praise and toys. Selecting the right handlers is just as important as the right dogs. Handlers must show a connection with the dogs, which include English Springer Spaniels, German Shepherds and Belgian Malinois from Europe. Seven rangers from the Kenyan Wildlife Service and six from Tanzania’s Wildlife Division went through two months of intensive training last year. They worked alongside dogs to detect ivory hidden in luggage, shipping containers and vehicles. Kenya toughened laws against ivory trafficking in 2014, which has led to a drop in elephant poaching. But it remains a major trafficking hub, especially through Mombassa, the major port for East Africa. Africa’s elephants are being decimated by poachers to feed demand for ivory from Asia. Across Africa, about 100,000 elephants were killed for ivory from 2010 to 2012. Sixty percent of Tanzania’s elephants have been poached since 2009. 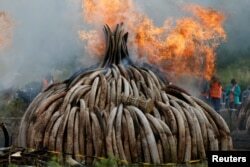 FILE - Fire burns part of an estimated 105 tonnes of ivory and a tonne of rhino horn confiscated from smugglers and poachers at the Nairobi National Park near Nairobi, Kenya, April 30, 2016.